The art and science of teacher questioning is a powerful force in any flavor of direct instruction. Marzano and associates (2001) found a roughly 22 percentile gain in student achievement when skillful questioning was an instructional focus. Furthermore, a focus on maximizing student questioning can be even more powerful. However, when asking teachers to begin a focus on the practice of questioning in the classroom, it is best to begin close to home. For this coming Wednesday’s job-embedded professional development, our principal asked each teacher to drag a colleague into their room to chart all questions asked in five or ten minutes of instruction. This will serve as a baseline for discussion in our PD session. This blanket strategy of “questioning” is one I have been asked to work on with teachers from time to time. The enlightened teacher is one who realizes that only an objective and friendly observer can truly assess the goings-on of a classroom. In 2008, a teacher is charged with juggling a plethora of variables in the classroom at any given moment. Therefore, it is easy to miss some of the more subtle things that go on. As a generalist instructional coach in a high school, this is one area where my work with teachers frequently begins. Ideally, this relationship will move from quick consultation toward more in-depth one-on-one coaching experiences. When a teacher enlists the ongoing services of an objective observer who possesses an eye for instruction… the gains can be rewarding for both teachers. As this latest round of questioning has approached the PD deadline, I have been asked in to do a quick assessment many times in the past few days. When several days of coaching feel the same, it tends to warp the mind. Trust me- rarely is one day the same as the next in this job. Thus the questioning cartoon. This one features none other than my wife- a talented and conscientious biology teacher. I can lay this baby out on the web because I know she can handle the parody. I’ll let you guess who the coach is in panel number seven. This artwork features the online cartooning software Bitstrips. This site has all of the characteristics of web 2.0. It is creative, interactive and often viral. It allows participation and recommendation to others. It is highly social and even allows collaborative remixability. On Bitstrips, you can create yourself (as an avatar that can then be used for cartoons) as well as your friends, enemies and acquaintances. How fun is that? Can you imagine some sort of educational application for this webapp? So today while I was sitting in Mrs. Nash’s classroom for ten minutes to chart all questions asked, I decided to share out the results (with her permission of course). Today’s topic plays out amusingly as a comic strip. However, the reproductive strategies of organisms actually do provide quite a valuable look into one of the major forces driving all animal behavior. In fact, MO Biology CLE 3.A reads that students should be able to “Distinguish between asexual (i.e., binary fission, budding, cloning) and sexual reproduction.” So from those ten minutes, you get a small chunk of questioning data, and a bit of classroom humor and fun in full cartoon color. Learning about primitive animals, like sponges, isn’t always the most exciting thing. Today, however, featured some great discussion. Lately I have taken to making my own classroom diagrams for teachers. I hate feeling restricted by left-brained forms. I wasn’t happy with any of the current forms I was using, so one day I just grabbed some printer paper and a tracing template I once used to help middle school gifted students with tesselations. I decided to do things a bit differently en route to a classroom last week. Most generally, as soon as I take a seat in the classroom, I begin sketching out the lay of the land -so to speak. Once the page is a customized black & white of the classroom, I scribble circles in the exact spots where students occupy a seat. Looking at my watch, I jot down the time and begin to take in the classroom happenings for the agreed-upon time frame. 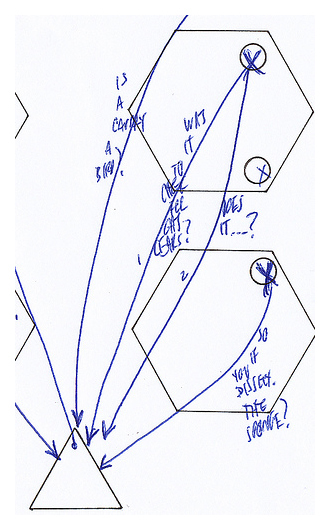 In that period of time, I trace an arrow from each person asking a question to the person they were addressing. 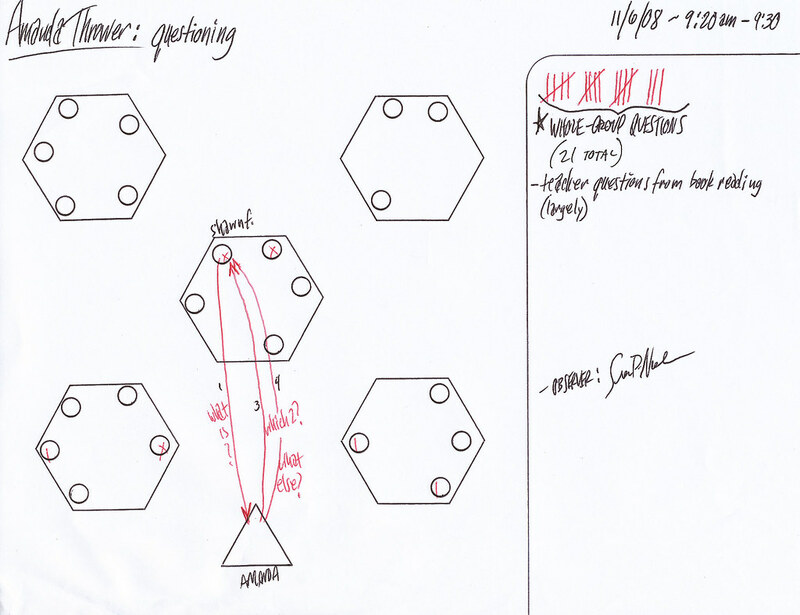 If the teacher directly asks Clint in table three a question, then the arrow traces from the teacher to that student. If Katy at table two asks a question of the teacher, then the arrow points from Katy, directly to the teacher. 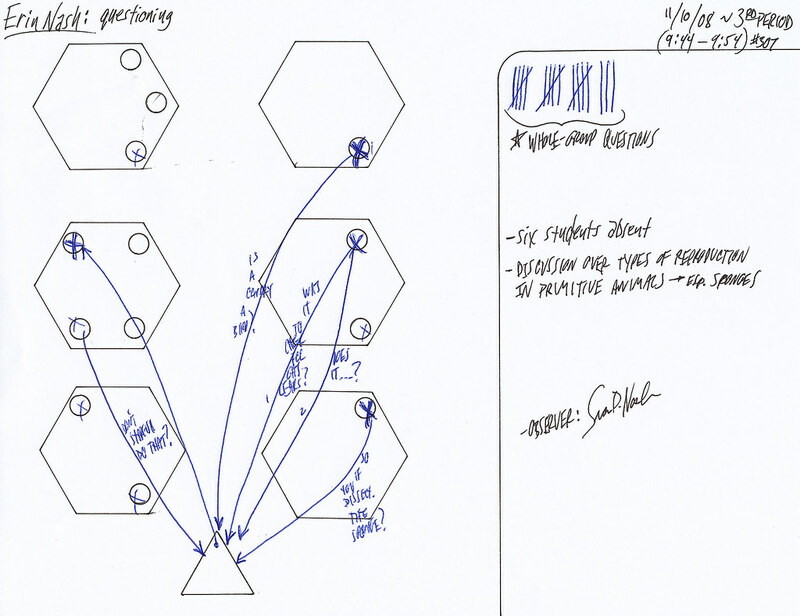 If Clint then directs a question toward Katy, the next arrow will be drawn directly from Clint to Katy. The final piece of data would be to record teacher-generated questions that are directed to the entire class. These are seen as hash-marks in the upper right hand corner of the sheet. This type of exercise generates a mere slice of data. Depending on the particular five or ten minute slice of time, you expect widely-varying results. Therefore, it is important to take several slices of data of a period of time to see overall numbers and trends. Again, brief samples of classroom questioning such as those highlighted above can be interesting and helpful. However, the real deal comes into play when the teacher wants to take the relationship further and delve more deeply into the art and science of questioning. Once the relationship between teacher and coach moves toward a longer-term, one-to-one relationship, great things happen. With trust, and open mind, and several small successes early on, this relationship is one of the most productive and rewarding to be shared by education professionals. You’re right! Erin is a sport for putting up with your caricature of her! Her insight, however, is pure Erin! Always reflective, always a learner. Ever so powerful. I love bitstrips. Even though it’s almost tomorrow, and even though I am totally exhausted from a day of events that could have easily split into three days worth, I am going to play. Don’tcha just lOvE web tools! I love the cartoon, and panel 8 is the exact same thing I would say! Tell me if I’m off, but what we’re doing in elementary with comprehension strategies (questioning) is going full circle by ending up in H.S. Not only are the teachers using it in instruction, but then you’re teaching the students how to use questioning… becoming higher order thinkers….????? Hey Jennifer – I agree. I think we really are starting to come full-circle with certain instructional strategies being integrated throughout the curriculum. The only thing is… I need to do another post about developing student-generated questioning as opposed to a focus on teacher questioning. This is a far more important skill, but you have to start somewhere. In fact, as opposed to the strategic level in comp. strategies, questioning really is both process and content when it comes to a comprehensive science education. Questioning the world is not only a process scientists use, it becomes a fundamental science concept. And for that reason and many others, it is quite beautiful. I can tell you LOVE your job and your discipline!!!! Yes, you are right about student generated questioning. I’m curious to see that in action. Off the cuff……..if we become proficient in elementary at teacher led questioning than truly secondary would be able to totally focus on the student generated end of it.?? 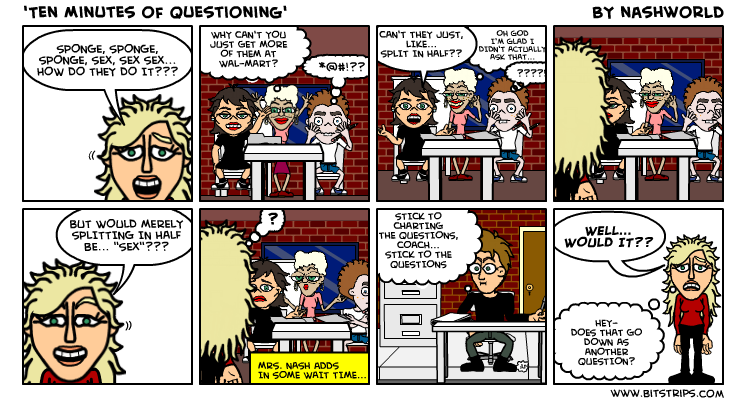 Please let me know if you start a blog post on student generated questioning..